This is Neff Zone column number 700. That’s a big number. The first column appeared in 2004, so 14 years is another significant number. I tell people that after 14 years half of Cadillac thinks I am an institution and the other half thinks I belong in an institution. Since we’re thinking about numbers, this might be an appropriate time to consider some numbers that have been in the news recently. For example, with Easter being tomorrow, the National Retail Federation tells us that the average consumer will spend $150.05 on this holiday. When it comes to candy perhaps the most quintessential Easter treat is Peeps, those colorful marshmallow chicks. This year Peeps is celebrating its 65th year and all of them are made at the Just Born factory in Bethlehem, Pennsylvania. In 1954 it took 27 hours to make a Peep by hand. It now takes just six minutes and 5.5 million Peeps are born every day. Each year enough Peeps are produced to circle the earth twice. That production is needed because 1.5 billion Peeps are consumed each spring. 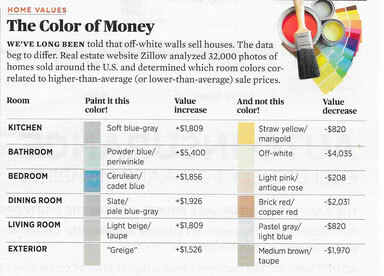 In fact, the right paint color can add to the value of a home, while the wrong color can actually decrease its value. For instance, a bathroom painted powder blue/periwinkle increases the home’s value $5,400 while off-white decreases the value $4,035. This Easter you may be hosting people from out of town. If they seem a bit cranky as a result of their travels there may be a good reason. Flying in an airplane has become a “tight” situation. The amount of average legroom between seat rows has narrowed from 35 inches to 31 (or even 28). The average seat width has shrunk from 18 to 17 inches. Speaking of cash, if you have currency in your wallet you could test positive as a hard drug user. “ Researchers from the University of Surrey in Britain found: “Drugs are now so prevalent that 13 percent of those taking part in a test were found to have traces of class A drugs on their fingerprints - despite never using them.” The main traces were of cocaine and heroin. Thanks to all the readers who took the time to read even one of the 700 Neff Zone columns. Now, onward to 800!